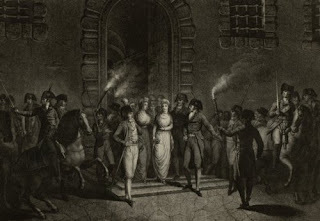 After the monarchy had fallen on 10th August 1792, the royal family was transferred to the Temple Enclosure, which, as the Queen rightly guessed, would become their prison. The guards became even more insulting, singing offensive songs in front of the family and even threatening to kill the King and Queen, which greatly terrified the young Louis Charles. Marie Therese was also lodged in a room where indecent drawings were present, but the King succeeded in having them removed. Here the royal parents continued to supervise their children’s education, under the scrutiny of the illiterate guards, many of whom believed that, when studying maths, they were actually writing in a secret code. The King also read a lot while the women kept themselves busy with needlework. In the evenings, Marie Therese would dine with her parents after her brother had gone to bed, and, before retiring herself, she would often hug her father. At first, the children were also permitted to play in the garden. But after the September prison massacres, in which the Princess de Lamballe was brutally murdered, the situation of the royal family became even worse. They were moved into the great tower (Marie Therese shared a room with her mother), but the King was kept in a separate room from the rest of the family, who could see him only at dinner. Wax, paper and other utensils were also taken away from them, and they were forced to speak loudly so their jailers could hear every word. In December, the King, who was now forbidden from seeing his family, was put on trial. He was found guilty and condemned to death, a news his family heard by a crier walking by the Temple Prison. On 20th January, he was allowed to see his wife, children and sister for the last time. Everyone was distraught and clung to Louis. Marie Therese became hysterical. She couldn’t stop crying and fell to the floor. The following day, 21st January 1793, the King was guillotined. His surviving family, who deeply grieved for their loss, wouldn’t be allowed to stay together much longer. 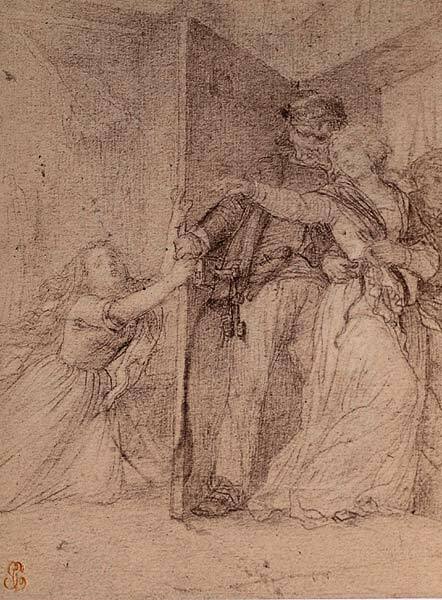 In July, the revolutionaries took the Dauphin away from his loved ones. Marie Antoinette fought like a tiger to prevent this, but in vain. The following month, it was the Queen’s turn. She was removed to the Concergerie, where she awaited her trial. Marie Therese was now left alone with her aunt Elisabeth. They cried themselves to sleep for weeks. Elisabeth taught her niece how to take care of herself, fearing she would soon be removed too. 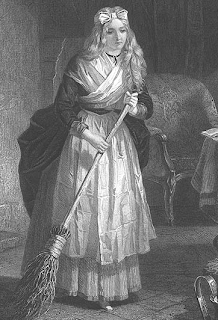 The young girl now also made her own bed and swept the floor. Both she and her aunt would both be searched daily by the guards, but were left alone most of time. The revolutionaries planned to use Marie Therese to testify against her mother at her trial. Because of this she was allowed to see her brother and was shocked and alarmed by how ill and bloated he looked. Marie Therese was also interrogated about the flight to Varennes and about many other vile things her mother was accused of. The poor girl was aghast and cried for most of the interrogation, which lasted for about 3 hours, but steadfastly refused to dishonour her mother or name anyone involved in their failed flight. She was young, but not easily intimidated. But even without her false testimony, her mother was doomed. The Queen’s trial was a sham and the verdict a foregone conclusion. On 16th October 1793, Marie Antoinette was guillotined. But no one bothered to tell Marie Therese, Louis Charles and Madame Elizabeth. In May 1794, Marie Therese was separated from her aunt too. Before she left, she told her nice to have firmness, courage and faith in God. A few hours later, this pious woman who had sacrificed everything to remain with her brother, sister-in-law and their children, was guillotined too. Again, no one told Marie-Therese. Marie Therese was now alone and, for most of the time, completely isolated and cut off from what was happening in the country. But she received a few visitors. The first was a man whom she believed to be Robespierre. He examined her cell and her reading materials. The young girl, who now refused to talk to anyone until she was told of what had happened to her mother and her aunt, handed him a note that read: “My brother is sick. I have written to the Convention for permission to nurse him. The Convention has not yet responded. I reiterate my demand”. Then, he left. The second visitor was Barras, a Jacobin and important member of the Convention. On 28th July, he decided to visit the royal children. He found the Dauphin in a very filthy room. He was ill, and just wanted to sleep and be left alone. Marie Therese’s room, instead, was cleaner but the princess refused to speak to him. He gave orders to allow the children to get some free air and exercise and summon a doctor for Louis Charles. These orders weren’t carried out but a new bed was provided for the Dauphin to replace his current, bug-infested one. 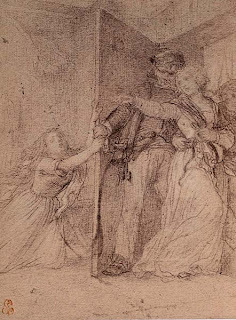 A new guard was also put in charge of Marie Therese, and, although he couldn’t tell her what happened to his family, acted with kindness towards her, even giving her some matches and candles to make the darkness less frightening. In December, on her birthday, she received another visit from three commissioners who had come to see the royal children. Marie Therese was knitting by the window, dressed in a gray cotton dress that couldn’t keep her warm. Her hands were swollen and nearly purple from the cold. She received another visit in February, but again remained silent. She was distressed and worried though that these officials could visit her at any time of the day and night. 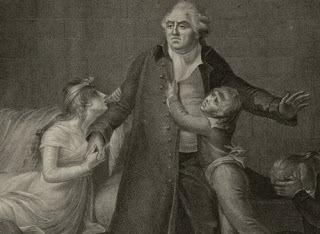 The fall of Robespierre changed the situation of the Orphans of the Temple, as she and her brother were known. The people were starting to wonder what would happen to them and the government was eager to be seen in a more human light. But for the little Dauphin it was too late. He had been left without medical attention and loving care for too long. In June, he died. Marie Therese was now the only survivor of her immediate family, but she didn’t know it yet. The people of France pitied her more than ever now and it became of immediate importance to the government that she should be allowed to leave France. They decided to send her back to Vienna in exchange for 9 French prisoners of war. They also appointed a companion for her. Her name was Madame de Chanterenne and, once again, she was forbidden to give Marie Therese any news of her family. But the young princess decided to talk to her anyway. It wasn’t easy. She had barely talked for a whole year and now her voice was scratchy and quivering. In the meantime, Marie Therese was also allowed to resume her studies and paint. She obtained more books, clothes and permission to walk in the garden. The guards also gave her a baby got a as a pet. By now, Marie Therese had grown very close to Madame de Chanterenne, whom she called “my dear Renete” and the woman finally told her that her family was dead. The princess was, obviously, distraught. The government now allowed her to receive visitors. Her meeting with her old governess Madame de Tourzel and her daughter Pauline was very emotional. They all wept together. Paper and pamphlets were smuggled inside the Temple so that Marie Therese could be up-to.date on the latest political news and, as soon as she received pen and paper, she started writing her memoirs of her time in the Temple Prison, which she gave to Madame de Chanterenne in the eve of her liberation for safe keeping in case she did not survive the journey. Finally, on her seventeenth birthday, December 19 1795, at midnight, Marie Therese was freed. She had been in prison for three years, four months and five days.